Over a million golfers a year travel to Myrtle Beach, South Carolina to experience the unparalleled selection of award-winning golf courses in the area. If you are planning a golf trip to Myrtle Beach, before heading out to the golf course you will want to explore at least one of the many golf stores in Myrtle Beach that can outfit you with anything from clubs to shoes. Here are profiles of some of the best in the area. You might want to wait until you get to Myrtle Beach to purchase anything you need for your golf game. Martin’s has everything you could possibly want before heading out to the golf course. Get your swing analyzed at the launch monitor, drive a few balls on the driving range and then make your selection. Make this your first stop in Myrtle Beach. If golf superstores don’t appeal to you, try Tee to Green, a smaller, more personal golf store that has been serving South Carolina golfers since 1988. Featuring all the best brands and professional service, Tee To Green is a great place for one-on-one service. You are sure to find the perfect golf shoe at one of the two Myrtle Beach locations of Golf Shoe Centers of America. Featuring the newest in golf shoes, plus an extensive clearance selection, Golf Shoe Centers of America offers friendly service and great prices. Choose from Adidas, Etonic, Callaway, FootJoy, Nike and more. Since 1987, Pro Discount Golf has been outfitting the complete golfer. Featuring a large selection of clubs, bags and other gear, this golf store offers plenty of options for the male, female and junior golfer at reasonable prices. After a day on the course, what else would you want to do but go to a golf store to find something new to help your game improve for the next day? 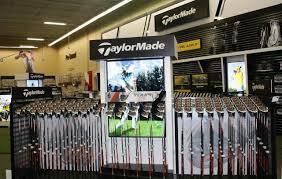 You will find golf stores on every corner in Myrtle Beach, South Carolina. Explore them all and you will soon discover your favorites! Over a million golfers a year travel to Myrtle Beach, South Carolina to experience the unparalleled selection of award-winning golf courses in the area.